The modern food processing industry has succeeded in convincing the public that they are getting nutritional value from many processed foods, when they are not. What the public is actually getting is chronic malnutrition from eating too much junk food. Stop eating all that Added Sugar! Junk food is food that has been processed to the extreme. Start improving your nutrition by reading food labels! You can avoid eating processed food that is more artificial than real. It is okay to eat moderately processed foods that contain more real ingredients than products of food science. You will know which is which by reading the food labels. 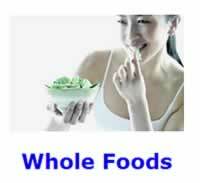 The more real or whole foods that you eat, the healthier you will be. Be sure to buy and eat some naturally grown produce from your local grocery store. Low in salt or salt free. Get started improving your Nutrition at the Beginner Level. Where to start? The recommended approach is to tackle what is easiest to change first. Beginners should start moving away from eating junk food towards more whole foods. Eat Whole Food, NOT Junk! The easiest dietary change that anyone can make, with a big impact on improving their nutrition and personal health, would be to STOP eating junk food. Many mature adults, over the years, have forgotten what real food is. Rather than eat 100% home cooked meals, they eat adulterated highly processed junk that is the creation of modern food science. Are you a Fast Food junkie? QUESTION: It is not that I eat fries and not raw vegetables because I am lazy; it is because the French fries taste awesome and raw vegetables taste like grass. How does anyone learn to like food that is good for you? ANSWER: Believe me, French fries do NOT taste awesome, nor does eating healthy mean eating only raw vegetables. Food tastes are more a function of what we are used to eating, than they are an innate property of the foods that we eat. You think that French fries taste awesome simply because you are addicted to a high sugar, fat, and salt junk food diet. To change your food preferences, simply learn how to change your diet. Most health conscious individuals now mistakenly think of food in terms of protein, fat, or carbohydrates. Thinking about protein-rich, fat-rich, or carbohydrate-rich whole food is better. Most real foods consist of a blend of protein, fat, and carbohydrates. Protein, fat, and carbohydrates are usually not isolated in nature. Starting in the nineteenth century, food science discovered how to isolate protein, fat, and carbohydrates from whole foods. This development led to the creation of adulterated food. Today, 100% artificial junk food is being sold as real food. However, not all processed food is junk food. Indeed, avoiding all processed food would be very difficult to do in the modern world. Junk food can be viewed as food that has been processed to the extreme. The easiest way to improve your nutrition is by buying produce from your local grocery store. All food sold in plastic bags, boxes, or in cans is processed food. To improve your nutrition, simply start reading food labels. You may be surprised to learn that the so-called healthy juice that you have been drinking is more a creation of food science than Mother Nature. Most junk foods contain less than 5% of the recommended daily allowances (RDA) of any one of eight basic nutrients. Remember, that all processed foods enrich the profits of food companies, rather than to enrich your nutrition. To improve your nutrition and natural health simply stop eating Junk Food. Avoid eating processed food that is more artificial than real. Stop eating processed foods that contain too much junk, like high-fructose corn syrup, saturated fat, or salt. It is okay to eat processed foods that contain only a moderate amount of processing. These acceptable foods contain more real ingredients than products of food science. Further, some foods actually require processing. Whole grains as harvested are generally not consumed directly by humans, but require some type of processing (ex. milling of grains) prior to consumption. The more real or whole foods that you eat, the more you will improve your nutrition and the healthier you will become. Always consider the quality of the food that you are eating. Do NOT drink any kind of sugary beverage. Do NOT eat at Fast Food Restaurants. Do NOT eat anything Deep Fried or otherwise saturated with some type of hydrogenated vegetable oil, trans-fatty acids, or saturated fat. Fast food is fibreless food, by the intentional design of food science. Fast food cooks faster and lasts longer in the freezer, without spoiling. Do NOT eat anything sold in vending machines. Real food does NOT come out of plastic bags. Do NOT eat chips, pretzels, popcorn, crackers, etc. Do NOT eat pastries, cakes, or cookies. Eat fewer highly refined-grain, rapidly digested carbohydrates and more whole-grain, slowly digested, carbohydrates. Pastries, cakes, and cookies are high in saturated fat. Do NOT eat processed Foods more man made than real. In other words, drink orange juice, the real deal, NOT "Tang" the drink of astronauts. Do NOT eat mass marketed Breakfast Cereals, like Froot Loops. Do NOT eat any kind of candy. Do NOT turn a salad into Junk Food, by including too much cheese, meat, or saturating it with any kind of processed salad dressing. To find out if a food is a junk food you must look at the first two ingredients. Junk food is a slang word for foods with limited nutritional value.